Nansen Center scientists in Bergen and St. Petersburg have in two resent papers in the Tellus addressed the climatic temperature amplification in the Arctic, analysing respectively surface air temperature records and atmospheric modelling simulations results. The papers are published under the bilateral Russian-Norwegian NORRUSS project “CLIMate variability and change in the Eurasian ARCtic in the 21st century (CLIMARC)” funded by the Research Council of Norway and the Russian Fund for Basic Research. The CLIMARC project is coordinated by the Nansen Center in Bergen and implemented in cooperation with the Nansen International Environmental and Remote Sensing Center in St. Petersburg and the Voeikov Main Geophysical Observatory of Roshydromet. Johannessen et al. 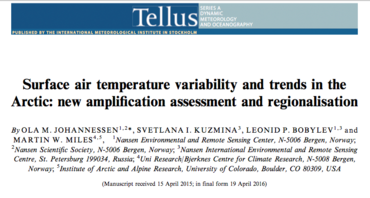 addresses in the paper Surface air temperature variability and trends in the Arctic: new amplification assessment and regionalization the Arctic amplification of temperature change as an important feature of the Earth’s climate system. For observational assessment and understanding of mechanisms of this amplification, which remain uncertain, thorough and detailed analyses of surface air temperature (SAT) variability and trends in the Arctic are needed. Johannessen et al present an analysis of Arctic SAT variability in comparison with mid-latitudes and the Northern Hemisphere (NH), based on an advanced SAT dataset - NansenSAT. They define an index for the Arctic amplification as the ratio between absolute values of the Arctic (65°-90°N) and NH 30-yr running linear SAT trends. They demonstrate that the temperature amplification in the Arctic is characteristic not only for the recent warming but also the early 20th century warming (ETCW) and subsequent cooling. The amplification appears to be weaker during the recent warming than in the ETCW, simply because the index values reflect the more pervasive nature of the recent warming that reflects the background of anthropogenic global warming. They also produced a new Arctic regionalization created from hierarchical cluster analysis, which identifies six major natural regions in the Arctic that reflect SAT variability. Statistical comparison with several climate indices shows that the Atlantic Multidecadal Oscillation (AMO) is the mode of variability that is most significantly associated with the amplified warming-cooling in the Arctic, with a stronger correlation during the ETCW and recent warming than during the intermediate period. Regionally, differences are also identified in terms of annual and seasonal rates of change and in their correlations with modes of variability. In the second paper - Arctic amplification: does it impact the polar jet stream? - Meleshko et al. investigate the hypothesize that the Arctic amplification of temperature changes causes a decrease in the northward temperature gradient in the troposphere, thereby enhancing the oscillation of planetary waves leading to extreme weather in mid-latitudes. To test this hypothesis, they studied the response of the atmosphere to Arctic amplification for a projected summer sea-ice-free period using an atmospheric model with prescribed surface boundary conditions from a state-of-the-art Earth system model. Besides a standard global warming simulation, they also conducted a sensitivity experiment with sea ice and sea surface temperature anomalies in the Arctic. Meleshko et al. show that when global climate warms, enhancement of the northward heat transport provides the major contribution to decrease the northward temperature gradient in the polar troposphere in cold seasons, causing more oscillation of the planetary waves. However, while Arctic amplification significantly enhances near-surface air temperature in the polar region, it is not large enough to invoke an increased oscillation of the planetary waves. This paper was highlighted under "Science in other journals" in Science.